This is a big crowd from which several groups or a few faces emerge. Some men surround a woman; they manhandle and threaten her. She is a beautiful woman, her hair is undone and, sometimes, she is a little undressed; she has been caught in the act of adultery. Whom with? It is not said. Her countenance is quite contrasted according to the works: alternately repentant, indifferent, frightened, provocative… Artists have taken many liberties with the text. Jesus is with his disciples; he speaks with them or bends down to the ground while looking at some letters or signs he has just drawn. The meeting between the woman and Jesus takes several forms according to the compositions. As here, they can be in the centre. The woman, sometimes on her knees, weeps or implores. Jesus gives her a gesture of forgiveness or else draws on the ground signs one cannot see. The crowd listens, a few old men go away, meditating on Christ’s words. They can be seen in the middle of the crowd. The men who have arrested the woman push her forward so that Jesus should intervene. They press Jesus to condemn her and even seem to threaten him too, as in the Arrest in the Garden of Olives. They can be separate, more or less moved away by the crowd. 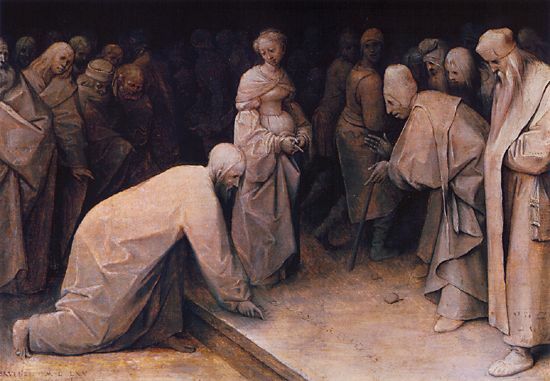 Jesus speaks to the men around him while others are agitated around the woman; some already have stones in their hands to start the stoning of the adulterous woman. Master, this woman was taken in adultery, in the very act. Now Moses in the law commanded us, that such should be stoned: but what do you say? But Jesus stooped down, and with his finger wrote on the ground. So when they continued asking him, he lifted up himself, and said to them, He that is without sin among you, let him first cast a stone at her. And they... went out one by one. The Law is precise but Jesus asks them to judge in conscience and not simply to apply the law. The packed crowd threatens the woman and Jesus too. What is he going to say ? Jesus writes and looks at the women as for a silent dialogue; the crowd observes. Jesus has spoken; nobody throws the first stone; the crowd moves away. Two different versions of the context: the world of classical antiquity in Poussin and the oriental and romantic world in Polenov. Stoning was also the penalty applied in Islamic societies ruled by Sharia or Islamic Law. Nowadays it is still sometimes used in countries that have kept or taken up Sharia law. The phrase “to cast the first stone” or “cast a stone at somebody” remains to designate the one who condemns readily or with good conscience, hence its generally negative use.